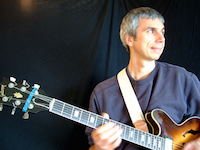 Bruno Pelletier-Bacquaert is the official Jazz consultant for The Guitar Channel. It was via his intermediary that I was able to conduct interviews with jazz greats such as Gilad Hekselman, Jonathan Kreisberg, Nir Felder and Mike Moreno. Bruno was in Paris for a few days before returning to San Francisco where he usually resides for his work as a music teacher at the university and for his private lessons. Sam Tharp interview – Fretish.com : Airbnb for guitars!